Greetings, peoples of the galaxy, I am Marcus. My mission is to provide truth, give hope to the oppressed of the Imperial Union and provide a reason for them to hope for liberty. I have been forced to hack this communications service in order to bring a message unadulterated by Imperial censorship. The peoples of the galaxy are not alone in their struggle for freedom, Aliit Breviin stands with all who seek liberation. Recently, in a joint operation by the Ori'Ramikade, an elite Mandalorian unit inside the Krath Alliance, we have struck a blow against the Tresario Star Kingdom and proven their leader to be naive and negligent. Orchestrated by the Sword of Krath, Aliit'buir Peter Max of Breviin and myself, we have made fools of 'King' Jude Vatz as we persuaded him to hand over hundreds of millions of credits along with a Modular Taskforce Cruiser in exchange for out of date intelligence and falsified documents. Furthermore, a team of revolutionaries have compromised the Tresarian Holonet and have acquired important information. I, Marcus, have taken a special interest and as our team exfiltrates over the coming days we intend to take all that we can to further strengthen our cause. Finally, what may seem most galling is that as part of this operation, we successfully convince King Vatz to start an internal witch hunt for traitors and spies while framing their most competent members. At least one faithful individual has a warrant issued for their arrest and has gone to ground before a sham trial and execution was issued. 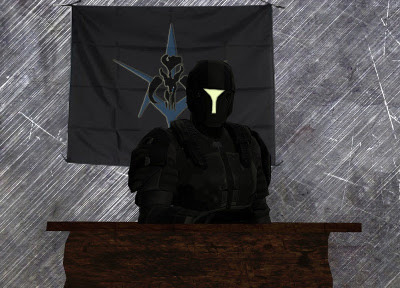 In a post operation report to me, Allit'buir Max said "Our revolution is not for sale, we must return to our ancient roots as the Imperial Union is a growing threat for our people. Sooner or later they will turn against Manda'yaim (Mandalore), this is why we must act now to prevent a greater war. During this operation we acquired vital intelligence that proved this. Mandalorians need to unite and face this threat as soon as possible. When tyranny rules revolution is needed to bring order!" The Sword of Krath, Grev'endar'togl, was "pleased with the results, they show the desperation of Imperial Union and the lack of trust inherent among its senior officers. Hearing of Union attack plans against Mandalore from King Vatz was vital for future plans. The Krath Alliance (and more specifically the Ori'Ramikade) have struck a blow for freedom today." I also received a report from Akaan'buir Roruk Drei who officially announced his retirement from active service at the conclusion of this operation. He stated to me that"The time has come to take a step back and allow the young blood of the revolution to take the place of this old bith. I am glad I had the opportunity to take one last stand against the Imperial Union in defiance as a part of this operation." Marcus is a name I made for myself. I am a patriot of my world and my people. I am not 'Galactic Alliance' nor 'Imperial Union', though I have been in both over my time. I look past borders and seek only peace for my people, a path that brought me to face our current foes. Manda'yaim WILL have peace and I will not rest until it happens, the Extolled shall rise. Date: Year 15 Day 193 Onboard the Interdictor-class Heavy Cruiser TMS Wrack in system n/a (328, 238). FORSCAN - The Tresarian Crown issued a press release today regarding an unsuccessful operation aimed at capturing a pack of violent criminals associated with the Galactic Alliance in the employ of the Krath Dynasty. The release included details recently declassified by the Tresarian Bureau of Intelligence regarding a long-term attempt to capture Peter Max, leader of the criminal organization Breviin Crusaders. The report stated that an operation was launched to capture Peter Max when one of his agents, Xavier De`Kal, was caught within Tresarian borders on an intelligence gathering operation. However, before he was able to face Tresarian justice, De`Kal committed suicide while in transit to a holding facility. Max then approached Tresario regarding his agent's death. He confessed his beliefs in the short comings of his employers and their recent truce with Mandalore, which he despised. Following this exchange TBI put into motion a plan to gather intelligence and eventually lure Max and his associates into Tresarian space to be arrested for crimes against the Crown. Unfortunately, it was soon apparent that both sides had been playing one another. In order lure Max to Tresarian space, the Breviin Crusaders were paid a moderate sum for intelligence that was credible but very outdated. The intelligence also included information on a mole Krath had in Tresario, Lieutenant Jenfaa Gaah, who had been a long serving loyal citizen. These accusations were quickly found to be entirely false. TBI decided to use this falsehood as a way to lure the Crusaders into a false sense of security. Unfortunately, before the operation could come to fruition the Crusaders fled Tresarian space with the credits that had been given, hailing every ship with tales of their triumph during their exit. When asked about this failed operation Minister of Military Operations Alto Rexar made this statement, "When planning intelligence operations they don't always pan out the way you hoped they would and that was the case this time. The Crusaders will attempt to make to make this sound as some grand stroke against us. This is simply not the case. We will continue to be vigilant against all threats. Further details will be provided as they are declassified." On Year 14 Day 1, a massive outbreak of a virus broke out in the Derra System, causing the inhabitants to become increasingly violent. The Breviin Militia was called to assist the Krath in not only quarantining the virus, but also to help rid the galaxy of a tyrannical mercenary group called First Sun. During this short war, the leaders of Breviin and some of its new recruits fought valiantly to accomplish these tasks. The most notable member of this operation is Aliit’buir Peter Max, who was able to make one hundred and fifty-one kills. Of these kills, more than half of them were First Sun officers trying to hold the planet Derra IV under their control. Other feats include the team efforts of Aliit’alor Xer`da Arman`de and Bajur’buir Morth Castul in a sweep through the planet’s capital, clearing out the enemy droids throughout it. Akaan’buir Roruk Drei and his sons were able to make several kills as well.